Sanitation issues came to the fore in the commercial capital on Monday with overflowing sewage creating nuisance and posing health hazard at Comba in the heart of the city near the Margao police headquarters and Pajifond. In fact, Monday saw overflowing sewage water causing hardships and inconvenience to Madgavkars at the three places right under the nose of the authorities. At Comba, sewage water from a chamber overflowed onto the main road, posing a health hazard to the residents. 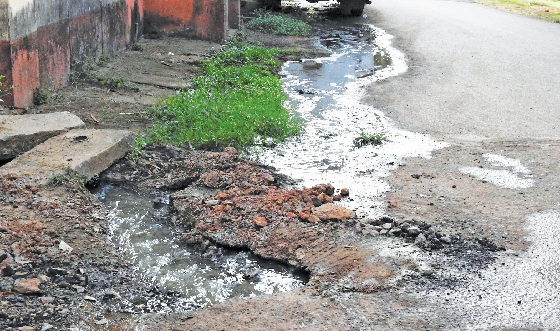 Residents of Comba claimed that the sewage water has been flowing on to the road for the last couple of days, but the authorities have not intervene to plug the leakage. Incidentally, sewage water has been flowing on the main road adjoining the district police headquarters since the last few days, but in vain. the road. Sewage water from the government Junta quarters flowed onto the internal road before it came gushing down on the main road at Pajifond on Monday noon. Strong sewage odour pervaded the Pajifond locality near the electricity and BPS club as the sewage water from the government housing colony flowed onto the main road, posing nuisance and health hazard to the citizens. This is not the first time that sewage water from the quarters has flowed from the colony to the main road.